The aligners are made through a combination of Dr. Gonzalez‘s expertise and 3-D computer imaging technology. As you replace each aligner with the next in the series, your teeth will move – little by little, week by week – until they have straightened to the final position Dr. Gonzalez has prescribed. You’ll visit Dr. Gonzalez about once every 6 weeks to ensure that your treatment is progressing as planned. With regular braces, you may experience some or all of the following: pain, discomfort, mouth sores or injuries caused by the brace wires, tooth decay (from inadequate brushing and flossing), plaque buildup, tooth discoloration, tooth/bracket breakage, or difficulty eating. As if that weren’t enough, there are also the personal sacrifices — popcorn, chips, bagels, hard-crusted bread, pizza crust, pretzel, nuts, certain candies…plus apples, carrots, corn on the cob, and more. 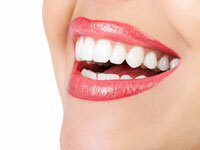 Many patients have asked about the benefits of veneers when compared to Invisalign. While veneers are certainly an option for improving your smile, they only cover up certain dental imperfections, rather than correct them. This means that some existing periodontal problems could still remain. Applied to the front side of the teeth only, veneers also require the removal of the surface enamel of each tooth — an irreversible procedure. Often considered a quick fix, veneers typically need to be replaced every 5 to 10 years — this can become very expensive in the long run. Coffee, tea and red wine need to be avoided to prevent discoloration, and care must be taken to prevent chipping or breaking the veneer. So while the surface look of the teeth may improve with veneers, the underlying tooth and gum problems could still exist.